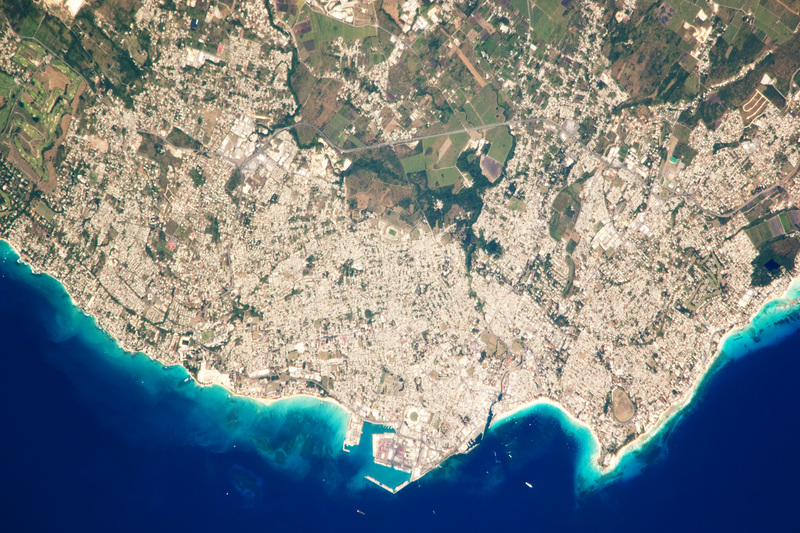 Posted by Jill S. Schneiderman in Barbados, satellite images. Click on link for full description of this image from NASA’s Earth Observatory. Posted by Jill S. Schneiderman in book review, Buddhist concepts, climate change, disasters, earth community, geology. This is cross-posted at Shambhala SunSpace. 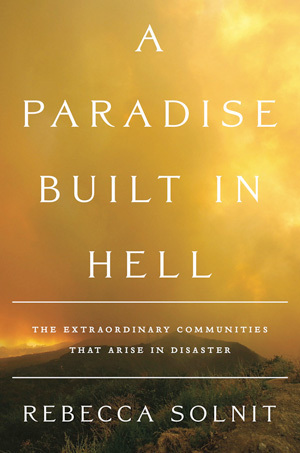 In an interview published about her recent book A Paradise Built in Hell: The Extraordinary Communities that Arise in Disaster (2009) in The Rumpus, a new online magazine focused on culture, Rebecca Solnit comments that “there are disasters that are entirely man-made, but none that are entirely natural.” In the book, Solnit examines five disasters and the behavior of regular people in the aftermath of the events: the 1906 San Francisco earthquake and fires, the Halifax munitions cargo ship explosion of 1917, the Mexico City earthquake of 1985, the events of 9/11 and Hurricane Katrina. Solnit’s interview comment caught my eye because as a self-proclaimed jubugeoscientist I recognize the truth of her important observation. I teach a course on Geohazards at Vassar College, so named to help students avoid the misperception that any modern-day disaster is completely ‘natural.’ The causes of so many of Earth’s disasters—not least among them climate-change augmented hurricanes—have roots in actions we humans undertake on the planet to satisfy our desires; the effects of our activities result in suffering among all living beings. Even more remarkable to me than Solnit’s accurate observation about the agents of disasters is her assertion that while hurricanes, tsunamis, and earthquakes are not to be wished for, they are among disastrous events that elicit our best responses and provide common purpose. Solnit maintains that “fleeting, purposeful joy fills human beings in the face of disasters. Everyday concerns and societal strictures vanish. A strange kind of liberation fills the air. People rise to the occasion. Social alienation seems to vanish.” Solnit’s affirmation causes my Buddhist heart to swell with joy because I see that she has unearthed evidence of metta (lovingkindness) and karuna (compassion) in unlikely events and places. It seems to me that Solnit shows us that in these moments of crisis, human beings become awake. Solnit’s message echoes the three jewels of Buddhism: Buddha, Dharma and Sangha. In the aftermath of disaster, people wake up to the reality that suffering is inevitable and also recognize that the way we respond to the suffering in our communities dictates whether that suffering will be alleviated or exacerbated. An August 2009 New York Times book review calls A Paradise in Hell, an optimistic book and The Rumpus recommends that one read it with Solnit’s earlier work, Hope in the Dark: Untold Histories, Wild Possibilities because together these books reassure us that our actions are important even when we don’t see—or can’t recognize—results in our lifetimes. I’ll be reading these books during the Copenhagen climate change meetings in the hope that negotiators will be able to wake up before the next wave of disasters roll in from the rising seas. Jill S. Schneiderman is Professor of Earth Science at Vassar College. This year she received a Contemplative Practice Fellowship from the Center for Contemplative Mind in Society. She is editor of and contributor to For the Rock Record: Geologists on Intelligent Design (University of California Press, 2009) and The Earth Around Us: Maintaining a Livable Planet (Westview Press, 2003). For more about Buddhism and Green Living, visit our special page on the topic here on ShambhalaSun.com. This entry was created by Sun Staff, posted on December 11, 2009 at 12:33 pm and tagged Environment, Sustainability. Bookmark the permalink. Follow any comments here with the RSS feed for this post. Posted by Jill S. Schneiderman in climate change, geology, hydrologic cycle. In “The Odds of Disaster,” (12/9/09) Thomas Friedman writes, “…evidence that our planet has been on a broad warming trend has been documented….” With the brouhaha about hacked data from East Anglia’s Climatic Unit looming over Copenhagen, I recommend the online archive of glacier photographs from the National Snow and Ice Data Center (http://nsidc.org/data/glacier_photo/index.html). With regard to the Muir Glacier, according to U.S. Geological Survey scientists, the glacier retreated more than seven miles and thinned by 875 yards over a sixty year period. One need not have a degree of any sort to see the melting. Whether or not anthropogenic greenhouse gases are the cause hardly matters; as the crysophere melts, meltwater expands, flows into oceans and sea level rises. Image used by permission: NSIDC/WDC for Glaciology, Boulder, compiler. 2002, updated 2006. Glacier Photograph Collection. Boulder, CO: National Snow and Ice Data Center/World Data Center for Glaciology. Digital media.